Hyundai’s original Santa Fe model, Iain Robertson recalls, was a ‘blobby’ but slightly clunky soft-roader that drew attention to the brand but did very little for its reputation, although it was more capable than many observers realised. It was tough trying to formulate a strategy for an all-new brand in the UK. South Korean Hyundai was establishing itself with Rootes Group technological and personnel fall-out in the mid-1970s but its not-quite-Japanese products lacked both intensity and integrity. It was genuinely a case of ‘must try harder’. Clearly made of sterner stuff, even while learning its trade, Hyundai girded its automotive loins and punched with a ferocity that was someway above perceptions. Yet, even in the late-1990s, it was a regarded as a brand in the ascendant. In fact, it was sturdy enough in its domestic market to ride out the Asian economic crisis that virtually gave it Kia Motors on a silver platter. Together, those brands have changed the face of volume manufacturing and middle-ground motoring forever. 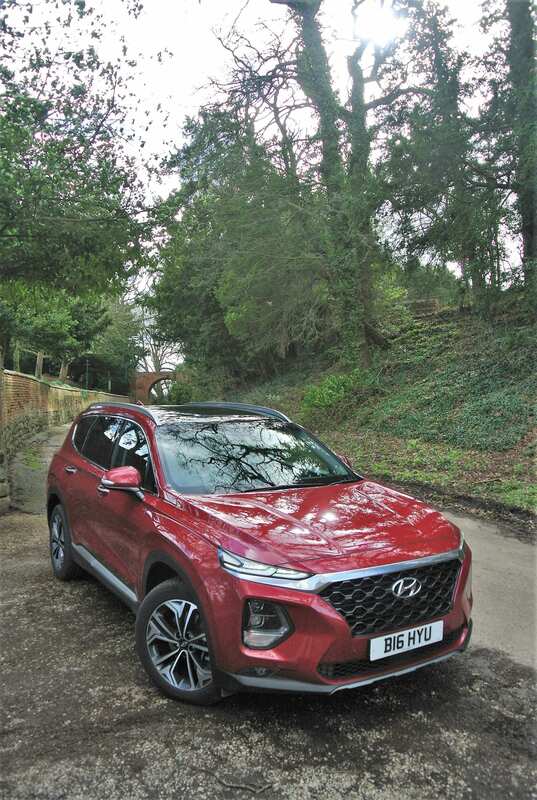 However, four generations in, the original having made its debut in 2001, the new five-seater Santa Fe, which has adopted the attractive slit-eyed frontal appearance of the current Kona model, not only looks the business but sits comfortably in the upper echelons of 4×4 estate cars. In its top Premium SE 4WD Auto specification, it carries a (pre-dealer discount) price tag of £43,295, in a handsome range that starts at a more affordable £33,425, yet its top variant is so comprehensively equipped that the buyer will want for nothing having made the acquisition. It is almost impossible to imagine how the firm has developed its latest Santa Fe from that original version, so radically different are they. Through three generations, not including the mid-life refresher exercises carried out, plus several in-production upgrades, the Santa Fe has transmogrified from rough-as-a-badger’s-arse runabout to sophisticated family estate car, possessing a go-anywhere potential. All Santa Fe models are now powered by the same, refined, 197bhp, 2.2-litre turbo-diesel engine, cleansed by AdBlue catalyst injections. It is a punchy unit, producing a healthy 324lbs ft of torque that warrants both tremendous towing capabilities (2.0-tonnes braked trailer) and a prodigious off-road potential, courtesy of an electronically managed 4×4 system (HTRAC). Featuring a Driving Mode selector button, it is possible to scroll through Comfort, Eco, Sport and Smart settings, each of which alters the drivetrain bias magically from front, progressively to rear/4WD, through a series of default settings that also change the electronic instrument pod colours and layouts. In Sport, it is red and shows a lot of information. In Eco, it is green and shows only a small portion of the speedometer but concentrates on helping the driver to obtain better efficiency. In Smart, which became my favoured setting, the dial changes from blue to red in direct relation to throttle use. Judiciously staged, the 4×4 settings take the hard work out of off-roading. The system can also be locked in 50:50 form (up to 19mph, when it unlocks) for really tricky conditions. Driving through a smooth 8-speed fully-automatic gearbox, complete with over-riding steering-wheel paddles (or the stick can be slotted across the gate for manual selection), the car’s stated performance is really solid, with a top speed of 127mph, 0-60mph in a modest 9.0s, emitting 164g/km CO2 and returning 44.8mpg on the Official Combined test cycle. Without trying hard, I obtained an average of 44.0mpg during the course of the test period and, on my 100-miles mixed conditions test route, the Santa Fe attained a superb 47.8mpg, aided by the ‘stop:start’ program and a hyper-efficient ‘auto-hold’ for the parking brake (which is not a default option and must be selected with each drive). At 4.77m in length, the Santa Fe is a large car. Fortunately, it reflects the dimensions in a truly spacious and comfortable cabin. 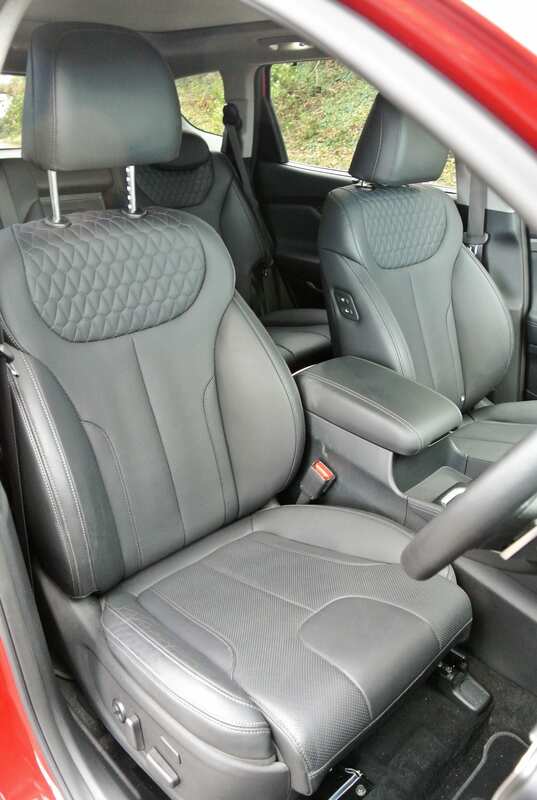 Its hide-clad seats are supportive and electrically adjustable in the front. The passenger seat can even be adjusted by the driver, courtesy of an easy-to-reach pair of switches on its right side-bolster. The driving position is commanding and excellent, the power steering requiring a mere 2.5-turns from lock-to-lock for easy manoeuvrability. 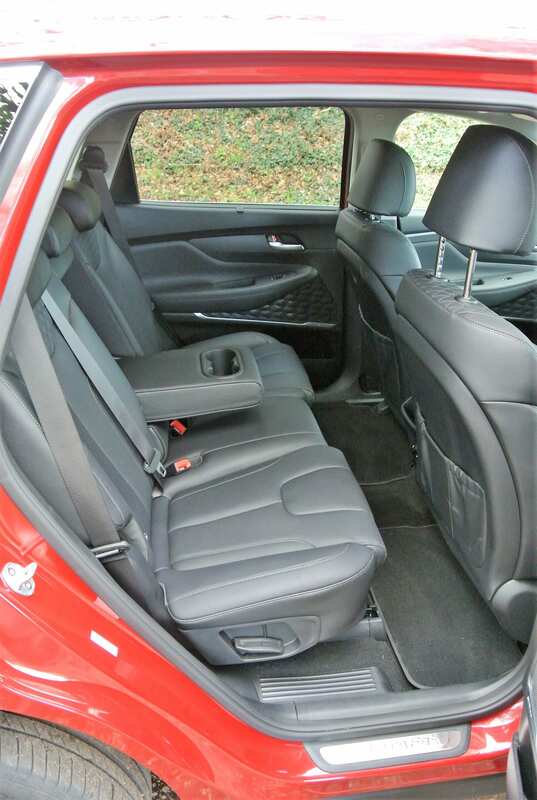 Its boot is also enormous, no longer providing an optional pair of jump-seats, and there are plenty of useful storage slots dotted around the interior, with a charging-pad for mobiles in the centre console. Leather is wrapped around the steering wheel rim and spokes, as well as the dashboard’s upper surfaces, for an extra up-market splash. It is not ‘Audi-style’ but, then, it is not Audi price either and it possesses an unique quality appeal. 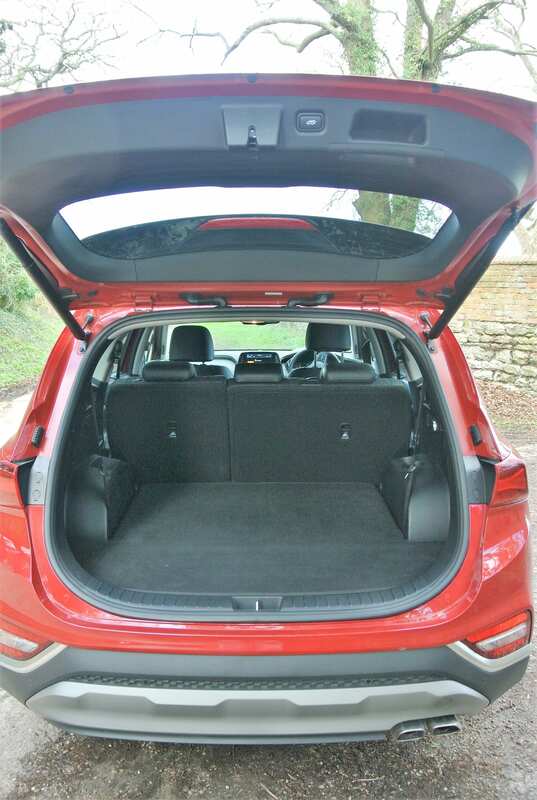 As is to be expected of a modern car, the Santa Fe is packed to the gunwales with safety, driver aids and semi-autonomous goodies. Fortunately, they can be switched off, the lane-keeping program being one of the most irritating, with its in-built tugs on the steering wheel and warning buzzers. Until our roads markings are improved and made more readable by a car’s sensors, these systems will possess little more than annoyance novelty factor. The information screen in the centre of the pod can be reconfigured to show 4×4 torque bias, trip information, or even sat-nav directions, with some of the detail also being projected onto the windscreen’s ‘head-up display’. 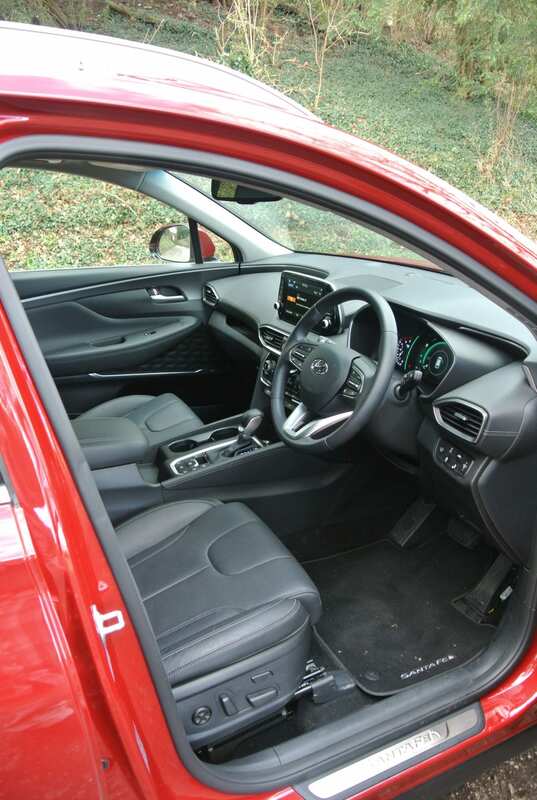 Santa Fe drives very well, its general ride comfort erring on the side of cossetting, which results in a relaxing and very refined experience overall. It tracks true (once you ‘neutralise’ the lane-keeping switch) and, despite its relative fluidity, handles crisply and responsively. Hyundai has worked very hard to achieve the right balance with its biggest family car and its beguiling smoothness and sophistication will be appreciated by drivers seeking unquestionable reliability, a long (5 years) warranty and low running costs. 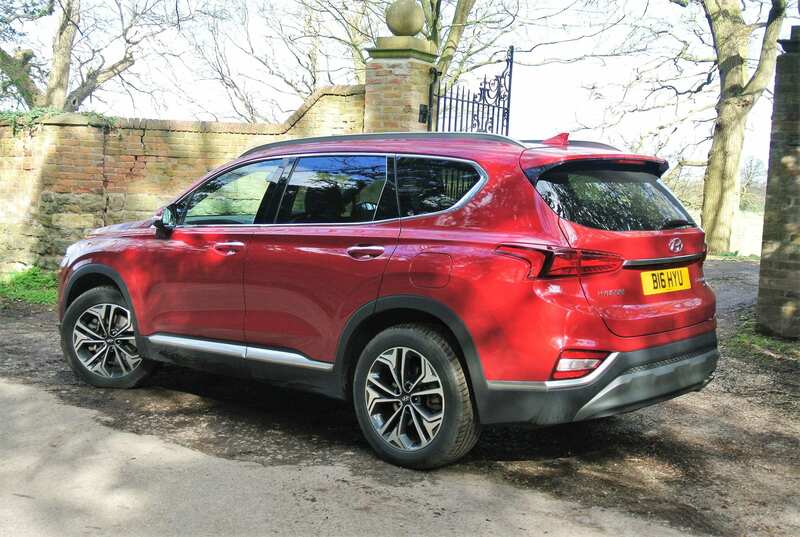 Conclusion: Competent, comfortable, spacious and exceedingly well-equipped, the Hyundai Santa Fe, in top-spec, is a car worth closer inspection, should you be in the market for a full-size 4×4. Competitively price-tagged, it will be loved for its available space and raft of practical features.